Winter wheat harvest progress is around 7-10 days ahead of last year. Given the relatively dry summer, early reports of yield have been average to below average although crop quality has been respectable. A significant amount of annual weed seeds can be produced and dispersed after wheat harvest if the ground is left fallow. In some years, annual weed seed can mature in as little as 4 weeks after harvest. Planting a cover crop (i.e. oats) after wheat harvest can do a nice job at minimizing the amount of annual weeds going to seed and then allows an opportunity in the fall to terminate the cover crop and deal with perennial weeds at the same time. 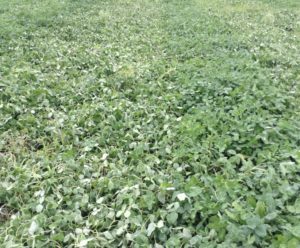 If it is not desirable to plant a cover crop, shallow tillage can also reduce the amount of weeds setting seed and will allow the perennial weeds to re-grow so that they can be managed in the fall. 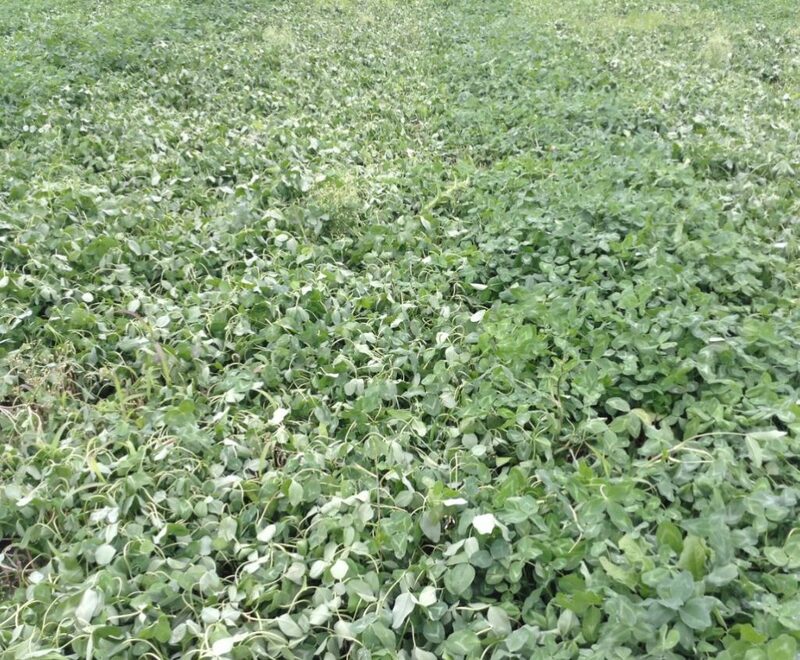 Red clover biomass is initially stunted during the first week after application but does recover within 2-3 weeks. Targeting broadleaf weeds when they are smaller will result in better control, if annual grassy weeds are predominant then the application of MCPA Ester will be insufficient and clipping is a better option to minimize weed seed dispersal. Figure 1: Red clover at 7 days after an application of MCPA Ester (left) compared to an un-treated strip. Note the curling of the leaves giving a slightly grey appearance. 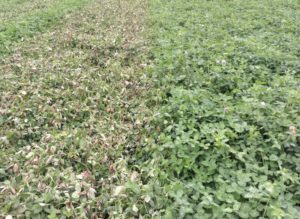 Figure 2: Red clover at 7 days after an application of MCPA Amine (left) compared to an un-treated strip. The amine formulation has consistently provided greater foliar burn then the ester formulation. 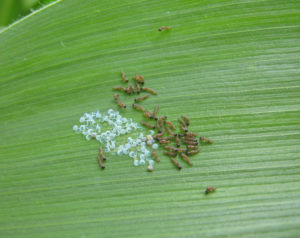 Figure 3: Newly hatched western bean cutworms (1st instars) from an egg mass. Western bean cutworm moth trap counts have been very low so far compared to previous years. An interactive map of trapping numbers can be found at www.cornpest.ca. Many corn fields have begun tasseling and may avoid much of the risk though it is still important to scout for egg masses now (Figure 3). The action threshold for WBC is a cumulative total of 5% of plants with an egg mass within a three week period of before, during and after peak flight for your region. The optimal timing for spraying insecticides for WBC control is during fresh silk stage, which ensures that you are protecting the ear from all of the larvae that have hatched on the plant. Download the pestmanager app (www.pestmanager.ca) to have access to management options for this pest. Although some areas in the province have had seen soybean aphids populations at the action threshold and have sprayed, much of the province has aphid populations below the action threshold. Regular scouting should be done from now until the R6 (full seed) stage of soybean to minimize any yield loss with this pest. The aphid advisor app, which can be downloaded at www.aphidapp.com is a new tool that helps assess whether or not control of soybean aphids is warranted and also indicates other fields’ results by county across the province. The action threshold is 250 aphids per plant on 80% of the plants and is actively increasing when the crop is in the R1 stage until end of R5 stage. Monitor two traps per field to determine WBC presence in your area. Scouting adjacent corn fields is encouraged since WBC is extremely difficult to find in beans before the damage is done. If the adjacent corn field has reached threshold and the two traps at the dry bean field have accumulated at least 150 moths, it is a good indication that the dry bean field will need to be sprayed once pods are developing on the plants. This is particularly true for larger seeded beans like cranberries that not only result in picks from the feeding damage but also seed discolouration from exposure to oxygen from holes in the pods created by WBC. Try to scout for pod feeding before making a final spray decision but use both the trap counts and adjacent corn field scouting as the key indicators. Refer to the moth trapping maps at www.cornpest.ca to identify areas where moths are actively being trapped. 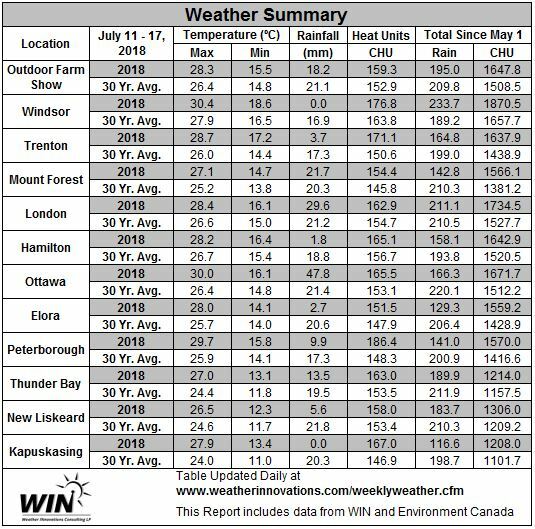 Rain was highly variable across the province this week, giving some fields relief while others continue to deal with moisture stress. 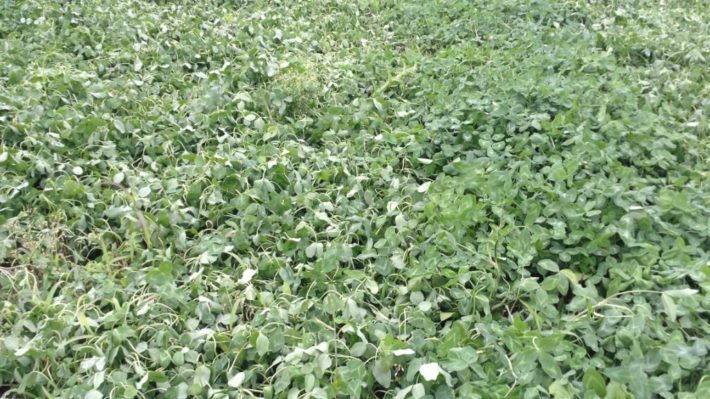 Information on the implications and help with making cropping decisions in dry conditions can be found at OMAFRA adverse weather webpage provided in the link below.